The meaning of the seal characters: Tangshi zizi sunsun yongzi xiexiang, appears to be obscure but it may be translated as 'For the perpetual use of the Tang Family'. The meaning of the two characters xie xiang is not known. A square seal from the Yuan dynasty carved atop with a dragon of similar form, is in the Beijing Palace Museum, illustrated in Zhongguo Yuqi Quanji, vol. 5, no. 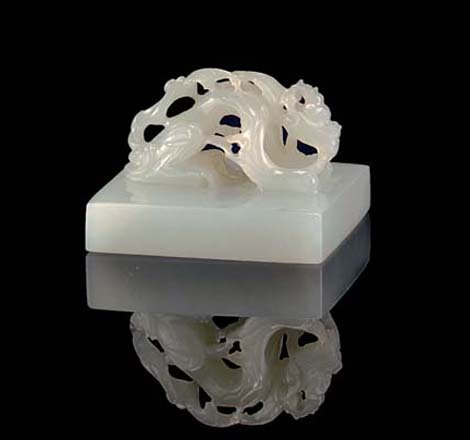 164; an example dated 14th-15th century, was included in the Oriental Ceramic Society exhibition, Chinese Jade Throughout the Ages, Victoria and Albert Museum, 1975, no. 342; and another, also attributed to the early Ming dynasty, was included in the exhibition, Dr Newton's Zoo, Bluett & Sons Ltd., London, 1981, illustrated in the Catalogue, no. 46.